There are couple of very exciting whitewater river rafting trips near Sequoia - Kings Canyon National Park, California, with trip options for both beginners and experienced rafters alike. Just outside Kings Canyon National Park you'll find the Kaweah River in the town of Three Rivers, CA, about 20 minutes from the park entrance. A little further north is the Merced River, which is a short two hour drive from Sequoia - Kings Canyon. 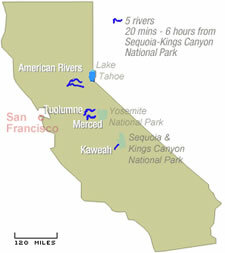 There are several more California whitewater rafting rivers within a 4 - 6 drive from Sequoia National Park. The Tuolumne River is outside the northern entrance to Yosemite National PArk and is about a 4.5 hour drive from Kings Canyon.